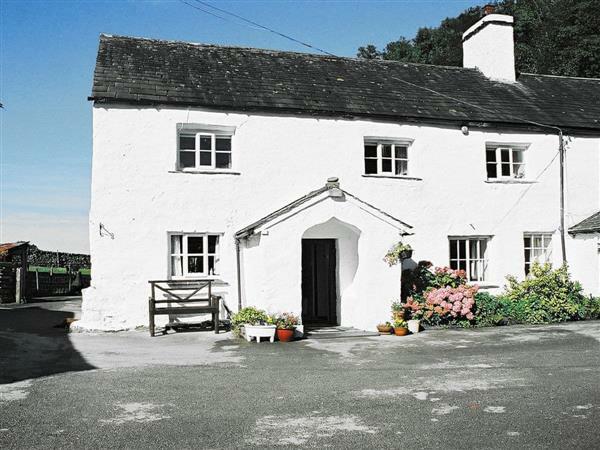 This charming wing of the owner’s 16th century farmhouse is fully self-contained and is all on the ground level. The cottage retains many original features - some low ceilings, exposed beams and thick walls for coolness in the summer and warmth in the winter. The pretty rooms have been stylishly furnished to provide a cosy haven for 2 people, ideal for a romantic holiday. Situated on a working beef and sheep farm in the tranquil countryside with superb views and lovely walks from the door, it is only 1.5 miles from Bowness and Windermere with their steamer trips, boutiques, galleries, pubs and restaurants. Windermere golf club is 2 miles away and just a short drive will bring you to the stunning Lakeland Fells. All on ground floor: Living room with double bed. Dining room/kitchen. Shower room with toilet. Beams throughout. Open fire in living room (initial fuel included). Elec central heating and electric included (extra charge October - March). Bed linen and towels included. Video. Electric cooker. Microwave. Shared w/machine. Shared patio. Parking (1 car). Holidays at Barker Knott Cottage run from Saturday to Saturday. For a better idea of where Barker Knott Cottage is, you can see Barker Knott Cottage on the map below. Barker Knott Cottage is in Cumbria; should you be on the lookout for a special offer, you can find all the special offers in Cumbria. It's always worth checking to see what is on offer at the moment. Do you want to holiday near Barker Knott Cottage (W40420), you can see other cottages within 25 miles of Barker Knott Cottage; have a look to find your perfect holiday location.